People are living longer than ever. While regular brushing, flossing, and checkups allow many of us to maintain our natural smiles for a lifetime, sometimes our teeth just can’t keep up. If you’ve lost a tooth (or several) due to injury or disease, dental implants can rejuvenate both your smile and your oral health. Implants are versatile. 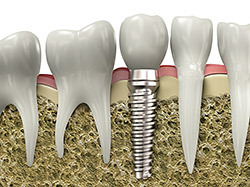 If you are missing only one tooth, an implant plus a replacement tooth will do the trick. If you are missing several teeth in a row, a few strategically placed implants can support a permanent bridge (a set of replacement teeth). If you have lost all of your teeth, a full bridge or full denture can be permanently fixed in your mouth with a strategic number of implants. Conventional bridges and dentures are not fixed to the bone, and can therefore be unstable. This can make it difficult to eat or smile with confidence. Implants not only look more natural, but feel and act more like normal teeth, with a stronger biting force. And because they don’t rely directly on neighboring teeth for support, implants don’t compromise the health of your natural teeth. In fact, bridges are expected to last only seven to ten years, even less with root canals, whereas implants will typically last a lifetime. 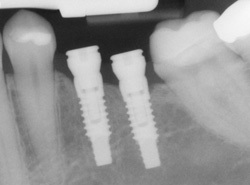 Sinus Lift Augmentation: Often the sinuses will enlarge following loss of the upper back teeth. This can preclude placement of dental implants in the upper back areas of the mouth, since the sinus is an air-filled space and dental implants need to be anchored in solid bone. A sinus lift augmentation/graft is a surgical procedure that restores the sinus cavity to its original size, and replaces the bone lost as a result of the enlarged sinus. This new bone graft typically takes nine to 12 months to heal before the dental implants can be placed into the grafted bone. Autogenous Bone Grafting: Occasionally, the ideal areas for dental implants do not have sufficient bone quantity to support the implants. In these cases, it is often necessary to “borrow” bone from another area of your mouth and graft it into the deficient area. Often, the area of choice is from the chin or back of the jaw where your wisdom teeth used to be. Implant Maintenance: Once your dental implant restoration is completed, it is vital to keep the area clean and infection-free. Dental implants can accumulate plaque and tartar just as teeth can. Whether you have just one tooth replaced by an implant or several, a professional cleaning schedule will be necessary to keep your implants healthy. The time interval for these professional cleanings will be determined by your individual needs.